The southern tip of the Baja California peninsula provides a scenic backdrop for E3Escapes' 13,000 sq ft luxury fractional home. Cabo San Lucas seemed to blossom overnight from a sleepy, remote fishing village into a leader in the resort scene, exciting tourist destination and hideaway for the wealthy. E3Escapes' Villa Las Palmas is one such hideaway. Hugging the coast, the villa showcases panoramic views of the marina and the breathtaking Sea of Cortez below. E3Escapes' offers three luxury components for fractional owners: a 13,000 sq ft home which comfortably sleeps 16, a 60' Hatteras yacht at the owners' disposal equipped with captain and crew, and 6-star services. 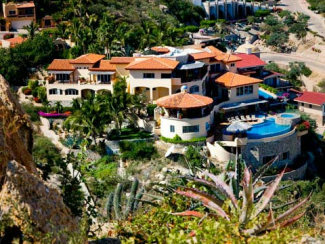 The Villa Las Palmas Collection in Cabo is the initial fractional ownership opportunity in E3Escapes' portfolio. Ownership shares of this collection are available in 1/12th, 1/6th, or 1/4th interests, with prices starting under $700,000. Inside the residence owners will find four private suites and two private casitas with a bathroom each, a wine cellar, movie room, game room with full billiard table and a fully equipped exercise room. The home is elegantly furnished and fully staffed. For instance, a private chef can prepare meals for guests in the Viking and Wolf furnished kitchen. The luxury continues as one steps outside and into the infinity edge pool with a swim up bar and raised spa. The property has its own practice putting green, gazebo with bar and patio dining. Spartacus at Sea, a '60 Hatteras Luxury Yacht, comprises the second dimension of this collection. The yacht, like the Suburban, is at the owner's disposal for daily excursions. This award-winning sport fishing yacht comes with an experienced captain and crew. Owners benefit from the crews' knowledge and expertise of the Pacific Ocean waters for fishing in the "Marlin Capital of the World". This vessel is built for sport fishing but doubles as a pleasure yacht, providing daily excursions ranging from scuba diving, snorkeling and whale watching, to sunset and dinner cruises. E3Escapes' third component is its 6-star service. The staff responsible for this high-end service is lead by a Concierge Manager and Guest Experience Coordinator, who will manage and maintain all aspects of the owner's stay. From concierge to transportation, cooking to housekeeping, all areas are covered, and the team is built so they can learn and adapt to each owner's preferences and tastes. When walking into the villa, each owner will feel at home with personal linens, family photos, private wine collection, and other personal items which are brought out from storage for their own private use. In addition to these services, a private hangar is available at the nearby executive airport for those flying charter and/or traveling to Cabo in their own plane or jet. 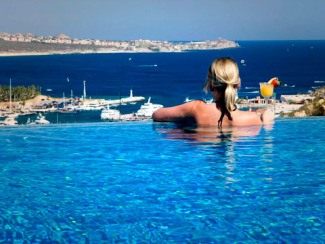 E3Escapes is currently planning and reviewing the addition of future collections in Cabo and other desirable vacation locations. On the onset of new properties in the collection, owners will be able to reserve time at any desired location in the portfolio. E3Escapes owners also have the option to exchange vacation time through Exclusive Exchanges. For those interested in checking out the property, E3Escapes offers a full-service inspection tour with customized itinerary to make sure prospective buyers experience both the Villa Las Palmas and the 60' Spartacus at Sea.